Jake Ludwig embraces Grant Gibson as the final seconds wound down during Roosevelt’s CCAC Tournament semifinal win over Saint Xavier on February 23 at the Goodman Center. The win sealed the Lakers’ first national postseason berth. The seconds on the seemingly omnipresent vintage clocks inside the Sanford Pentagon seemed to be moving extra slowly on March 7, 2018. Despite a chill in the air outside the old-school arena located in Sioux Falls, South Dakota, the nerves inside the stadium created an electricity warm enough to heat a city block back in sweet home Chicago. 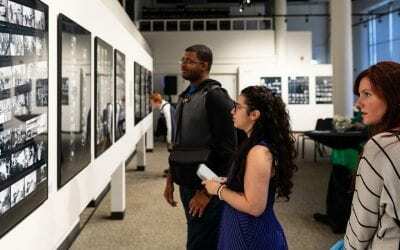 A game that was scheduled to tip off at 9:45 p.m. Central, a start time already extremely late by normal standards, was now being delayed until 11:15 p.m. due to a backup caused by previous games on the Pentagon’s main floor, Heritage Court, needing overtime periods to settle their scores. This contest was eight-plus years in the making. Another 90 minutes was no big deal. On this night, the Roosevelt University men’s basketball team was about to embark on its first-ever national tournament game. The Lakers, in the midst of their best season since the program was revived in 2010–11, was ready to take on the Southwestern College Moundbuilders, based in Winfield, Kansas, in the 2018 National Association of Intercollegiate Athletics (NAIA) Division II Men’s Basketball National Championship opening round game. In other words, Roosevelt was about to embrace the madness of March, a month well–known for postseason college basketball. The 2017–18 season officially started in August 2017, when head coach Joe Griffin and his new assistant coach, Roy Ramos, met with their returning and new student-athletes to go over a variety of preparatory aspects for the upcoming season. Team rules. Expectations in class and in the gym. Goals. 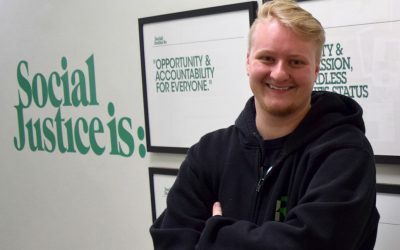 Often, Griffin and his team will come up with a motto encapsulating it all, a rallying cry that can easily be a written on a whiteboard, embroidered on a warmup shirt, or posted as a hashtag on social media. A short and sweet reminder to all members of the team what they are going to be about for the next eight months of training and competition. The result was TT: Toughest Together. “Our motto of ‘Toughest Together’ was generated in the middle of August before school began,” Griffin said. “We assembled our coaching staff and five returning upperclassmen to discuss not what we wanted to achieve, but who we wanted to be this year. Most teams and organizations all share the same outcome goals: wins, quotas, profits, etcetera. However, what we’ve been educating our guys about is that those are outcomes that result from our processes, and the greatest influence on attaining our goals was going to be a commitment to who we wanted to be as teammates and student-athletes. So, we vowed that no matter how good or how bad a game was going, or how a practice was going, we wanted to be seen as the toughest team in the country and the most together team in the country. Head coach Joe Griffin (front) hollers instructions during a game. Guided by that shared commitment to toughness and cohesion, the Lakers embarked on a journey that no other men’s basketball team in the University’s history has ever traveled. 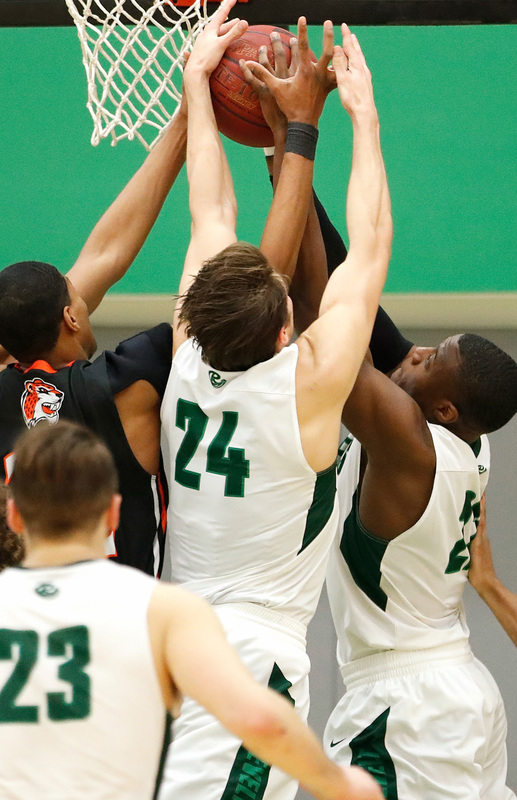 Roosevelt started the season winning its first nine games before falling on the road in overtime to a perennial Chicagoland Collegiate Athletic Conference (CCAC) power, Saint Xavier. The Lakers lost their next game—another tough road contest — to a team that broke out in 2017–18 as well: Governors State. The Lakers would see those opponents again, but Griffin’s side wouldn’t see many more losses going forward. Standing at 12-4 on December 29, Roosevelt proceeded to go on another nine-game winning streak to surpass the 20-win mark for the first time. The stage was set for a memorable finish. What made the Lakers stand out this year? A variety of factors were in play. Jake Ludwig drives by a Southwestern (Kan.) defender during Roosevelt’s NAIA Division II Men’s Basketball National Championship opening round game on March 7. Roosevelt featured one of the best players in the country in junior Jake Ludwig. Known by most within the program as “Lud” or “Ludwig” due to another Jake teammate, fellow St. Charles native Jake Asquini, the 6-foot-1-inch guard took another step as a dynamic difference-maker. He led the team with 17.2 points per game, fourth-best in the CCAC, while handing out a league-high 5.5 assists per game. Ludwig ranked ninth in the nation in assists per game and total assists (181) en route to All-CCAC First Team honors and the program’s first-ever NAIA Honorable Mention All-America designation. 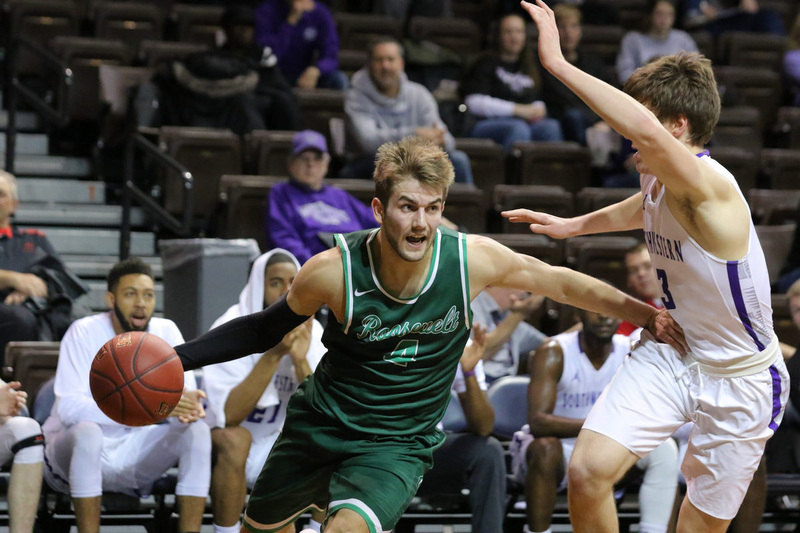 “Ludwig really responded this year as a junior, as all of our opponents were not going to let him get away with anything after his CCAC Freshman of the Year campaign,” Griffin said of Ludwig, whose accomplishments seemed even more impressive with team game-planning for him as the Lakers’ top option. “He was solid as a sophomore but took off as a junior after we made him the primary point guard. His three-point shooting improvement really separated himself and opened up his driving game, which is his best attribute. What makes him one of the best NAIA players in the nation, however, are his intangibles. He is tough as nails, yet humble and open-minded enough to know enough to seek out ways to improve himself and the team. “He is a coach’s dream in many ways,” Griffin said. Griffin referenced Ludwig’s toughness, and toughness also described the senior frontcourt duo of Adam Alexander and Joshua Dillingham. A pair of 6-foot-4-inch forwards who stepped on campus in the fall of 2014, Alexander and Dillingham grew under the coaching staff’s tutelage to become stronger physically and tougher mentally. They became pillars, contributing rebounding, defense, scoring and hustle that displayed the style that Griffin wanted his entire team to play with. With Ludwig pacing the offense and Alexander and Dillingham providing the size, Griffin relied on other student-athletes to play key roles. Kyle Bumbalough, the 5-foot-9-inch Hoosier State product, helped Ludwig in the backcourt. Chicagoan Carson Hughes provided shooting and rebounding from the guard spot. Asquini was a three-point threat every time he reported into the game. Newcomer Grant Gibson was hustle personified. Big men Kevin Day and Chandler Fuzak showed inside-outside balance in their games. Joshua Dillingham was a calming veteran presence during his senior season. Adam Alexander goes up for a dunk in a win over Governors State on February 10. 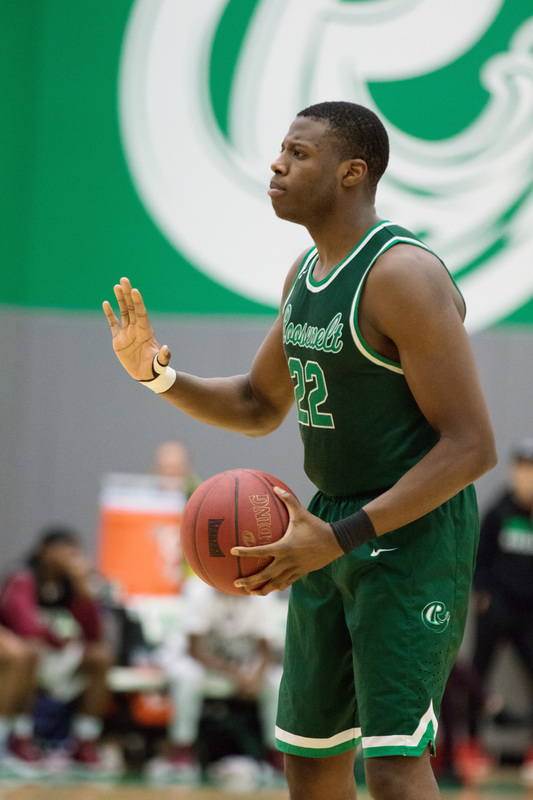 A key moment in the season occurred on February 10 as Roosevelt, who entered the NAIA Top 25 for the first time earlier in the week at the 24th spot, hosted Governors State, then ranked 18th in the country, at the Goodman Center for a battle of the CCAC’s top two teams. Led by Ludwig’s game-high 24 points and Hughes’ 21-point outburst off the bench, Roosevelt made a major statement against the Jaguars with an 83-73 win. 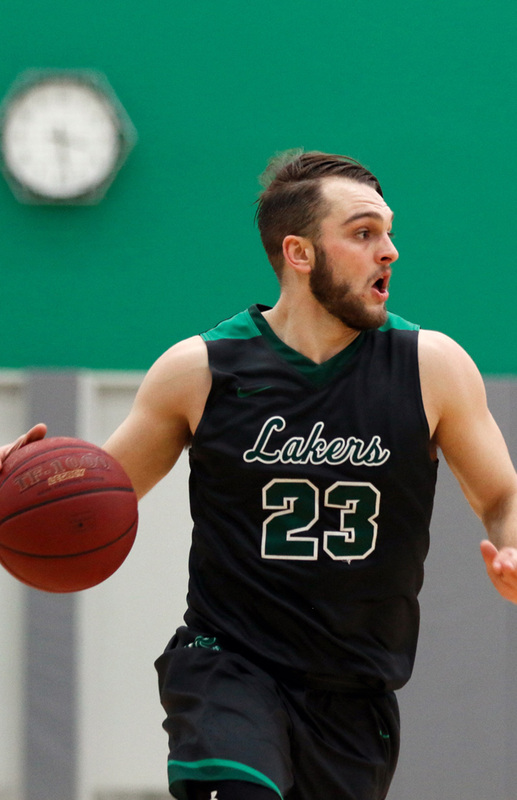 The Lakers won its final two regular season games after that victory and embarked on the CCAC Tournament, which would serve as Roosevelt’s closing argument for a first national postseason bid. 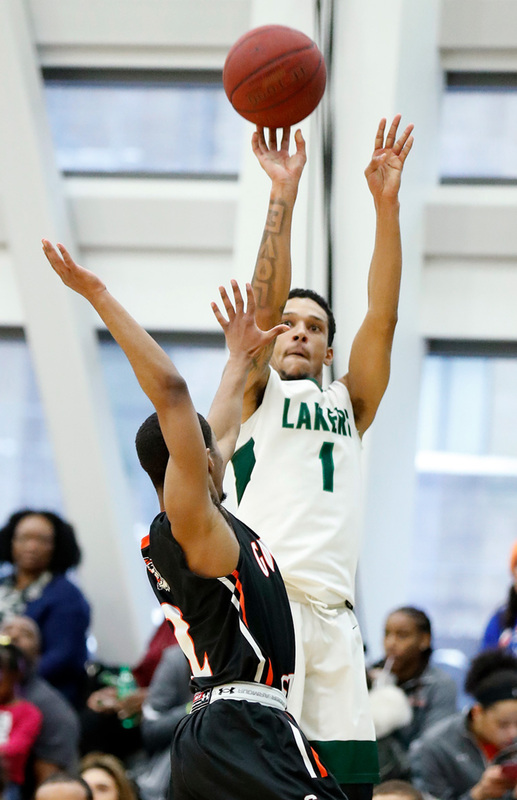 With Governors State winning the conference regular season crown and securing an automatic bid, the Lakers needed to win at least one game to be in good shape. If they advanced to the CCAC Tournament title game against Governors State, they would secure the conference’s other automatic bid to nationals. They achieved the first part of that mission, defeating Cardinal Stritch at the Goodman Center to advance to the CCAC semifinals for just the second time in school history, and put themselves in a great position come NAIA Selection Show time. Awaiting them was Saint Xavier, the only team that beat the Lakers twice in the regular season. 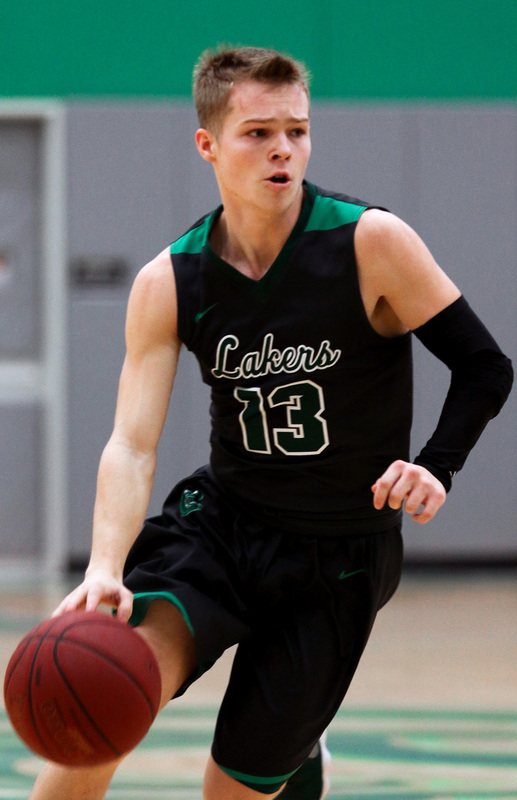 In front of a raucous Goodman Center crowd on a Friday evening heavy with anticipation and energy, the Lakers jumped out to a big lead against the Cougars. Hughes seemed to be knocking down every shot he took, and Ludwig facilitated an efficient offensive machine that led by as many as 23 points. Despite Saint Xavier cutting the deficit down to eight points late, Roosevelt made key plays down the stretch, and with the final seconds ticking away and word quickly spreading that Governors State had defeated Holy Cross (Ind.) 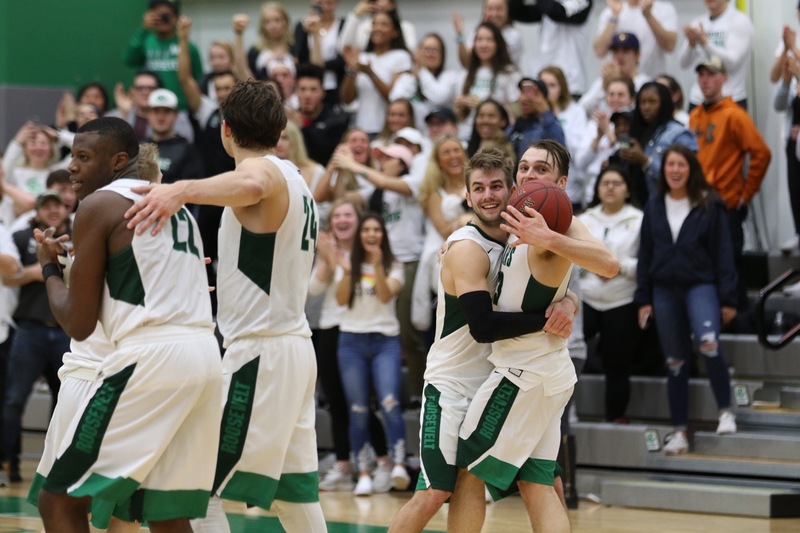 to set up round three in the CCAC Championship game, the Lakers started to celebrate more than a game decision on the court. Roosevelt earned the conference’s other automatic bid to the NAIA tournament. History had been made. The Lakers huddle before a game at the Goodman Center. Three days later the Lakers battled the Jaguars tooth-and-nail in University Park, Illinois, with Governors State winning the tournament title on its home court. However, the biggest achievement for the Lakers had been secured already. Roosevelt was guaranteed to be on the national basketball stage for the first time. For Griffin, reaching this point wasn’t a one-year process. 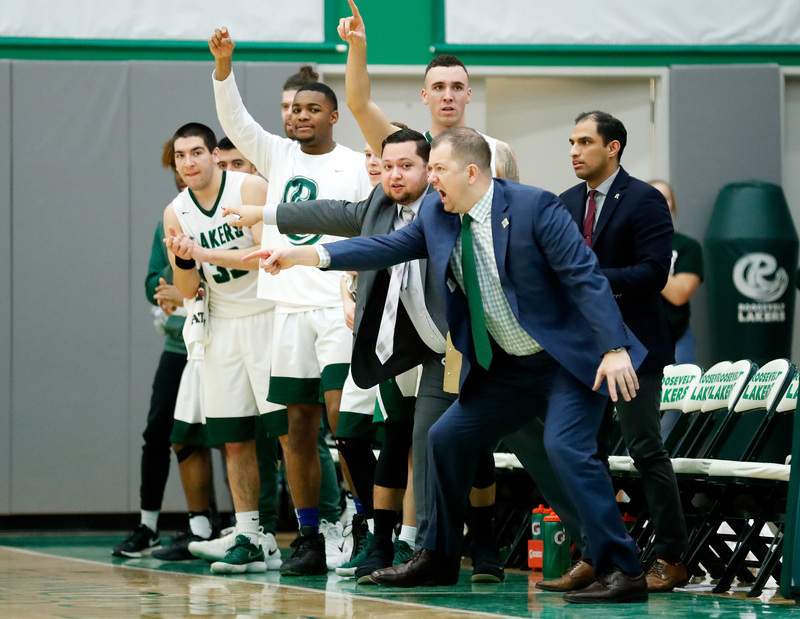 The architect of the program since he was hired in 2009, Griffin believes the 2017–18 season was a product of a culture that has taken almost a decade to mold and the result of a variety of areas he focused on that are not solely related to basketball. Griffin noted that, at the end of this academic year, his program has retained 24 out of 27 recruited student-athletes in the last five years, with all 24 expected to graduate within a 4–5 year time frame. 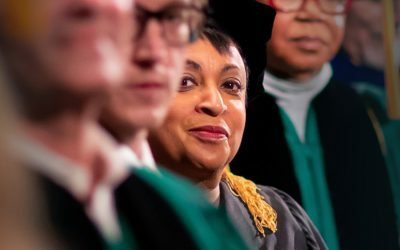 Come May 2019, Griffin expects that graduation rate to be 31 out of 31 in the last six years. 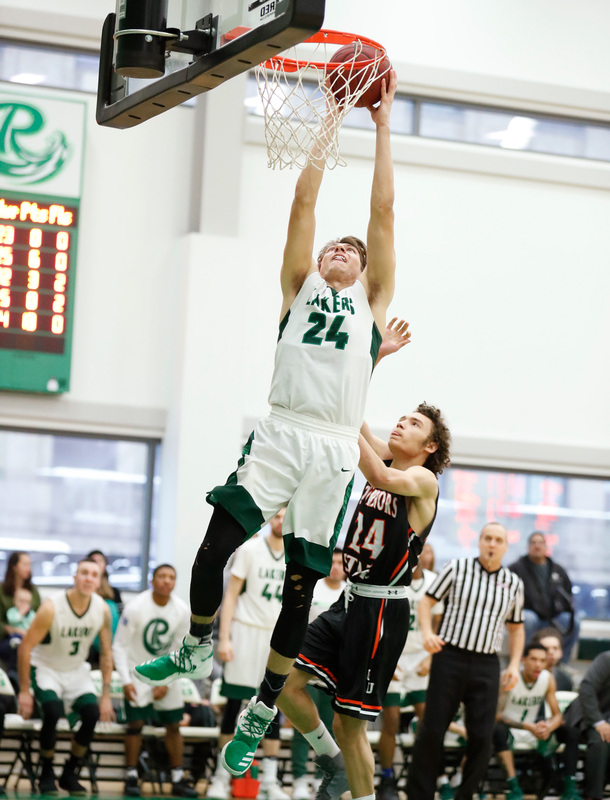 Ludwig attests to the all-around lessons he has learned from being a part of the Roosevelt men’s basketball team. Back to Sioux Falls, where the Lakers played the Moundbuilders at a time most people are either in bed or watching late-night talk shows. College basketball at midnight is not a usual occurrence. Roosevelt started the game strong, leading by seven in the first half, but Southwestern showed its experience and pulled away late, literally, to end the Lakers’ national tournament stay around 1 a.m.
Carson Hughes (1), Grant Gibson (23) and Kyle Bumbalough (13) were key backcourt contributors all year, while seniors Alexander and Dillingham (third photo) provided the frontcourt grit underneath the basket. The Lakers finished with a school-record 26 wins to just eight defeats. The numbers in the win-loss column do not change the approach Griffin will take going forward and the focus he will espouse for his team. 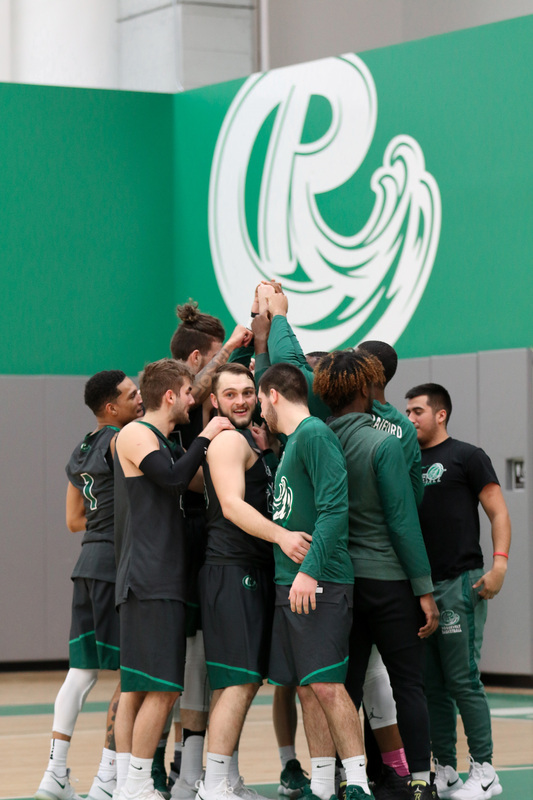 While it may be the last year for Ludwig and a big senior class, it will not be the last the nation hears of Roosevelt men’s basketball, all thanks to the foundation set by coaches, student-athletes and staff who played a variety of roles in getting the program get to this point. Even if it took 90 extra minutes on a snowy March night in South Dakota.